Club History | Rotary Club of Shepparton South Inc. The club held it s first meeting on March 16th 1974 at a gala dinner attended by 370 people, including 28 charter members, visiting Rotarians, partners, local dignitaries and guests. It was sponsored by the Rotary Club of Shepparton. Max Lincoln was the first president, who held office until July 1975. One of its first projects was an ‘Outdoor Exhibition”. This allowed the club to disburse $2133 to 14 different groups and charities at the end of its first year. The two large fund raisers across the years have been the Giant Water Slide and The Craft and Produce Market. 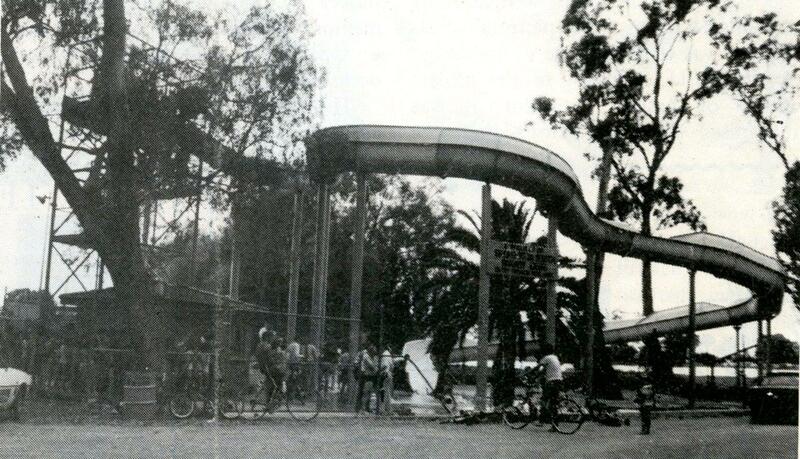 The 9 metre high water slide was built in 1981-2 under the management of Clyde Young. Its construction was based on direct technical and labour contributions from members as well as local contractors, with $68,000 either borrowed from Rotarians or bank loans guaranteed by Rotarians to cover initial expenses. The water-fed slide was 67 metres long with 4 or 5 major bends that delivered a fun ride down and into a 1m deep pool. It was a thrilling ride for children during hot weather and provided an important tourist attraction for the city. This proved to be an instant success, with takings of over $30,000 in the first season and loans being repaid in 3 years and thereafter raising many thousands of charitable dollars for the club. It closed in 1996-97, having reached the end of its useful life. The Craft and Produce Market replaced the water slide in 1997. It entailed the organisation of a monthly market where individual traders were charged a fee for their space at a common market place, namely the Queens Garden in Shepparton. The club also sold hamburgers, sausages and drinks from its food van parked at the site. Profits from this venture, all added to the club’s charity account have totalled nearly $400,000 (inflation adjusted) up to 2014. Fund raising, involving catering for outdoor events and car raffles continue to the present. Some functions have been organised to support specific charities. For instance, the charity auction programs organised in, 2011, 2012 and 2013 raised $20,000 for each of the GV Health Palliative care unit, Kids for Cancer and Cystic Fibrosis Research. Total fund raising over the first 40 years of the club amounted to over $1 million (inflation adjusted). These funds have been disbursed to many local clubs and charities, as well as to Rotary’s district and International programs. Support for the House for Homeless Youth in Shepparton amounted to $35,000 from 2001 to 2004. A contribution of $20,000 was made to GV Community care, $20,000 to Kids Connection, $10,000 was made towards the establishment of Westside performing Arts in 1997-98 and $5000 was contributed toward the Band rehearsal rooms in 1994-5. Other major contributions have been made to the GV Children’s ward, GV Retirement Hostel and GV Hospice Care. Numerous small grants have been made each year. Many projects have involved additional support in the form of labour and trade skills. Barbecues and shelters have been built for the Victoria Park Lake (two) and the John Pick Reserve. The Kitchen Garden and associated harvest classroom was built at the Wilmot Road School, building work was done at the Moira Park Scout Camp and improvements made to the Shepparton South Girl Guides hall. Club volunteers manage all Meals-on-Wheels deliveries one day a month. Youth programs, including scholarships, TAFE awards and support for students attending the National Youth Science Forum, Siemens Summer Science School and Murray Darling Freshwater School have endured through the years. The club sent around 21 local students on overseas exchange to Rotary clubs in Sweden, Japan, Canada, Sweden, USA and other countries, as well as hosting the return students from those locations. It also sent many young men and women on Rotary’s Group Study Exchange programs to other countries and similarly hosted the return teams in Shepparton. Five of our Rotarians have been leaders of those teams. In 2003 the club hosted the Conference of Rotary District 9790 in Shepparton, with around 800 delegates in attendance. The club has been a regular contributor to Rotary’s international charity, Rotary Foundation and has on many occasions contributed to International disaster relief through The Rotary managed Aqua-Box and Shelter-Box programs. In 1990-91 the club financed (together with other local clubs) the pilot training of a Solomon Islander. Since inception the club has maintained a weekly dinner meeting schedule, where members are informed by guest speakers and volunteers are recruited for their various events and fund raisers. Social events are also arranged from time to time, including an annual Christmas party, January garden party and occasional visits to businesses. Club outings have been arranged to locations such Boonoke sheep station, Plunkett’s winery and Dhurringile Prison.